If you feel that the Lord may be calling you to be a Sister of Jesus Way you will find that our book, “Precious in His Sight” shares more fully our way of life and the story of the community’s beginnings. Our way of faith in the heavenly Father to provide all our needs in answer to prayer, our first love for the Lord Jesus and our desire to follow the Holy Spirit as He opened or closed doors in ministry were all established in the early years of the community. 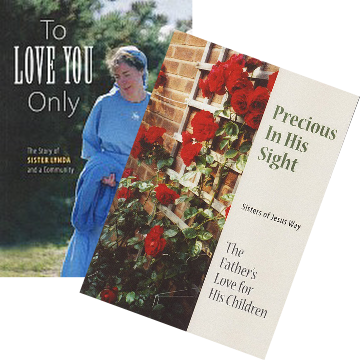 It may also be helpful to read our first book “To Love You Only – the Story of Sister Lynda and a Community”. Both these books can be obtained from the Sisters. Our address, email and telephone number are on the “Contact Us” page. It would be advisable to spend some time in the Guesthouse living alongside the Sisters. This could be for a number of weekends or it may be for a longer time as a volunteer helper. You would be required to be a baptised Christian not necessarily Anglican but joint membership with your own denomination and the Anglican Church would need to be acceptable at some later stage. We would require you to be single, free from debts including any divorce settlements and any responsibility for children who are minors. Our way of life is both sacrificial and rewarding; it is an inner journey as well as an outward one. God is with us and His love is unfailing. His love enfolds us as a community and in our life together and amidst many failures we seek to love Him and enfold others in the compassion and love of Christ. A final service of bridal consecration where promises of simplicity, chastity and fidelity are made comes after many years of testing a call.